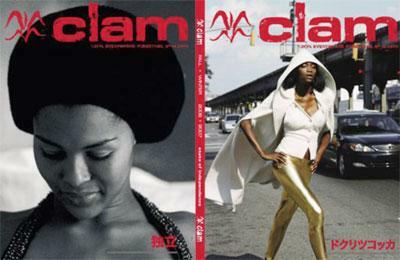 Cover of Fall/Winter 2006/2007 issue of Clam magazine (myspace). We will also get internationally known artists connected to Nigeria and Africa to participate in the soundtrack. Artists like the Nubians, Keziah Jones, Patrice, Ayo, Femi Kuti, and internationally known artists like Manu chao, Sade, Seal, etc … we will also have a remixed version of the soundtract by somebody like Frederic Galliano etc. We are hoping to create a soundtrack that will be on the level of "The Harder They Come" , or even "Shaft".